As I often say, your brand is “all of the things.” It’s not just a logo, the colors that you design with or the website that your potential clients visit. 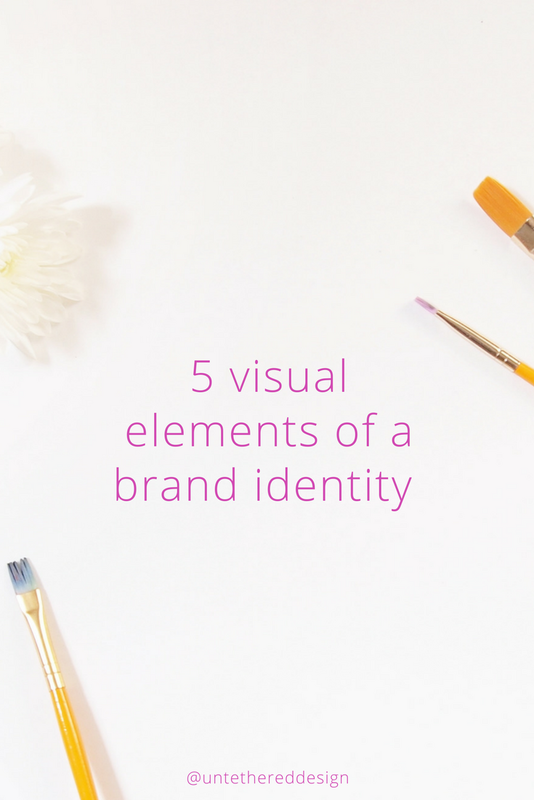 It’s important to understand that branding goes beyond the visuals — it’s actually an emotional experience — and it’s what others think of you. It’s an expression of who you are, blended with what you do, where, when, why and how you do it — and all of the impressions that you make on people who come into contact with you. It’s how your potential clients experience you online and offline. Although it’s a mix of your values, messaging, strategy AND design, it all really comes down to telling your story. But, in order to visually tell your story well, you must have the proper and professional design elements in place. 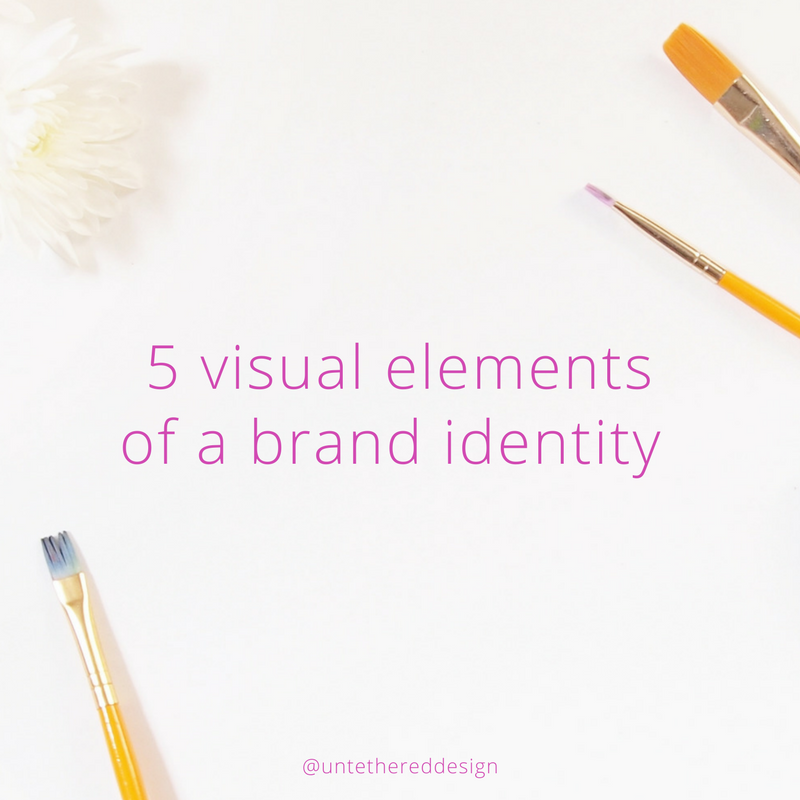 All of these individual elements work together to create a cohesive look and feel for your brand — and one that makes you look authentic and unique — and stand out from the crowd! 1. Logo: Your logo is the “face” of your brand — your major mark. The symbol that is unique just to you and that current and potential clients will come to recognize. It should be memorable and iconic — never too busy or detailed. It can be enclosed within a certain shape, its own free-standing design or illustration, or even just a simple typeform (your business name spelled out in a strong font, with or without a smaller graphic element integrated with it.) If your business name has a tagline, you can even create two logo versions — one using the tagline and one without it. In addition to your primary logo, you can also create a secondary logo that is a smaller icon, monogram, etc. that you can use in place of the main logo for special occasions. It might consist of the same colors and a simple element or two from the primary version. Make sure that your designer provides your logo in various print + digital file formats (.eps, .pdf, .png, .jpeg are all sufficient) and in RGB and CMYK color modes. 2. Typography: You should really have a collection of no more than 2-3 typefaces: a combination of a serif, a sans serif and a script. To learn what these are, check out this post! You can use a font from your logo, but you certainly don’t have to. 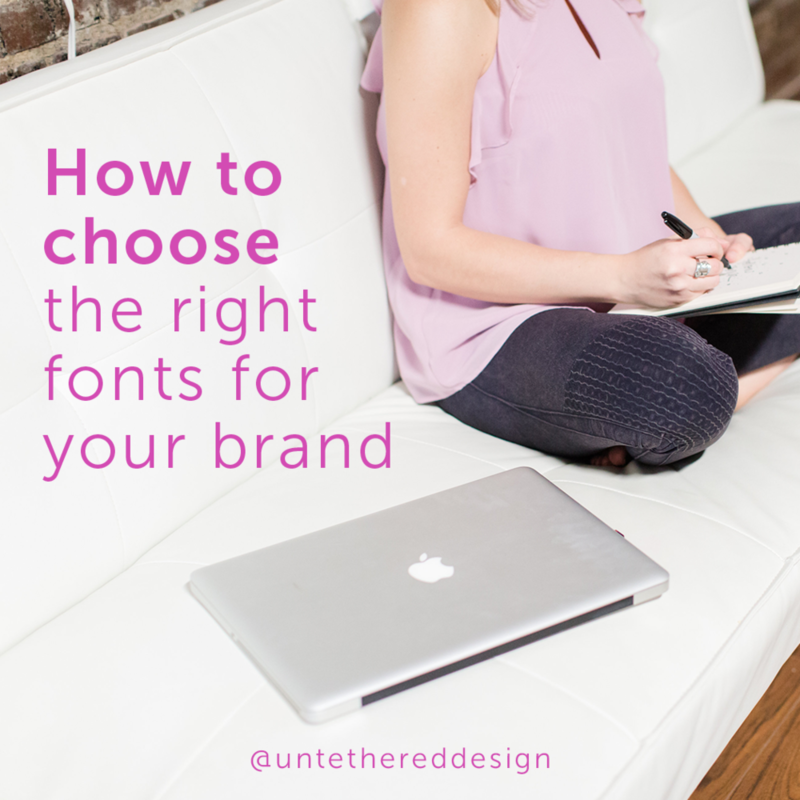 It’s important to simply use fonts that complement your brand, are visually-pleasing and readable — most of all. Make sure that you have the proper fonts downloaded to all of your computer systems, so that they are used by you and/your entire team consistently. You can even use 1 or 2 fonts just for digital purposes (for your email + website copy, etc.) that are web-safe, if you’re afraid that the main font choices that you use for print platforms won’t translate well electronically. 3. Color palette: While I suggest using no more than 2-3 typefaces in your visual branding, I do think that you can go a little “crazier” with the number of colors that you use AS LONG AS they all work well together. Feel free to piece together anywhere from 3-6 colors. Your palette should be representative of your brand’s personality and what will resonate well with your potential client base. Think about how different colors evoke different emotions. What do you want people to think and feel when they come into contact with your colors? And, don’t think that you just have to stop at 1. You can create a “primary” palette, which is the one that you use for your website, most collateral, is used within your logo, etc. But, you can also create a “secondary” palette that you use for smaller graphics, on social media, for special brand projects and more. For help choosing the right colors, check out this post! 4. Imagery: It’s crucial to use photos that have the same look and feel, no matter what it is. Light and airy, moody or bold/colorful are just a few examples. As long as they look similar and are used consistently, you are in good shape. You can use stock photos, but I really consider investing in some brand/lifestyle photos, so that you have a collection of images totally unique to you, that no one else will be able to use online. For example, my brand photos evoke the sense of white space, cleanliness and simplicity that I want my brand to express. In some photos, I even wear a purple top that is similar to the purple that I use in my brand colors. If I download free or purchased stock photos, I make sure that they also carry the same look and feeling. You can even go to a craft store and purchase some office supplies/decor that are consistent with your brand and create flat lays to take your own photos for channels like Instagram, even if you’re not a photographer. A lot of small business owners do this! While photos are important to consider, you don’t necessarily have to use them, either. You can incorporate illustrations (hand-drawn, watercolor, sketches, etc.) to express yourself, services, products and more — just as effectively. 5. Supporting graphic elements: Once you have your logo and other elements established, think about incorporating secondary elements to really tie together your identity and pack an extra punch. These can include icons, shapes, patterns, textures and lines that are used to complement your brand — to pull out pertinent information, break up text and add additional dimensions to your designs. 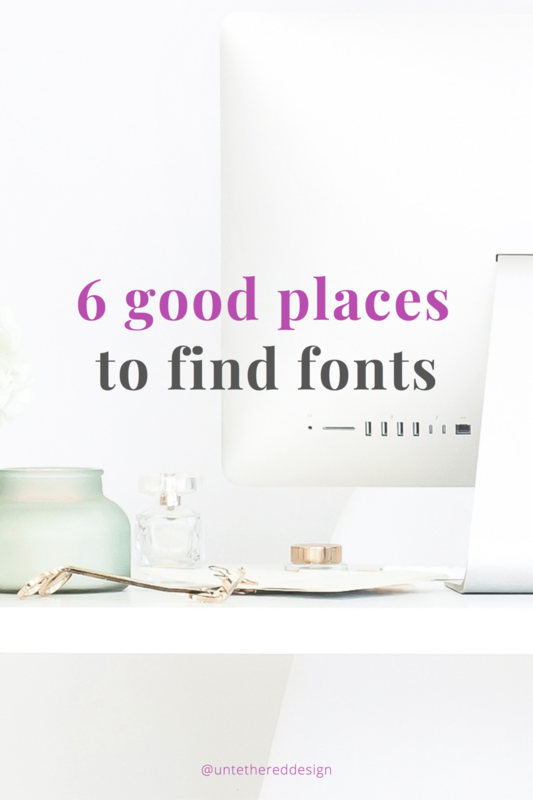 If you’re DIY-ing your brand, or you’re preparing to work with a designer and you’re searching for some font-pairing inspiration (whether for your logo or your website/graphics), it’s important to know what to look for and where to find it. First things first, let’s talk about free fonts. Free font sites provide fonts that are free for personal use and often have limited licenses that you must consider. You might be able to use some that have commercial licenses and are still free, but make sure to check first! 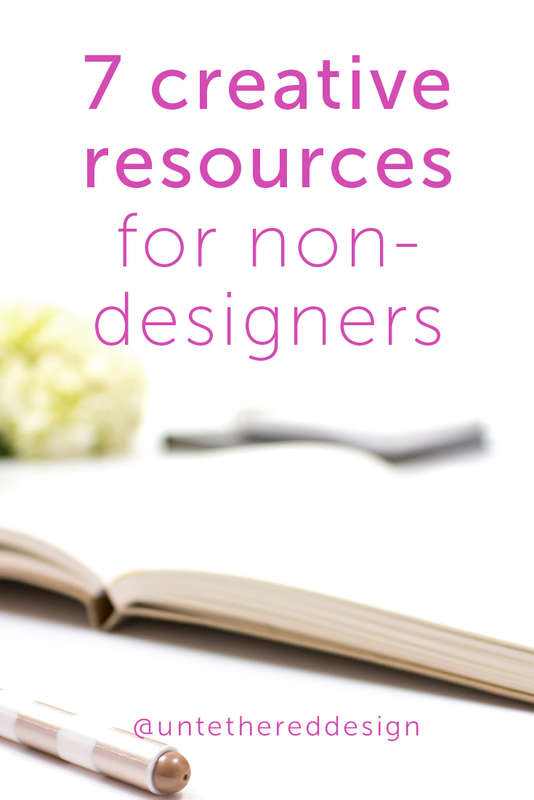 Some of these free sites also encourage you to donate to the font designer. Oftentimes, I like to peruse fonts that I want to use for a client job — and experiment with a few. 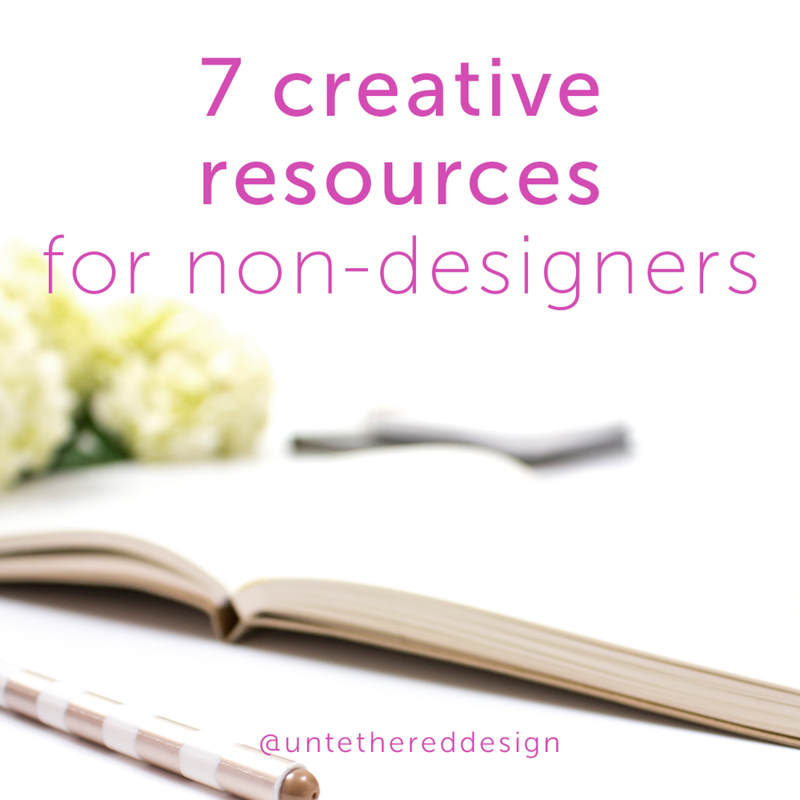 But, once I find the right font, I either find the link to the designer’s site to purchase it OR find a provided link that connects to creative resource sites like Creative Market or Design Cuts, where you can also purchase a commercial license for the font — and that might run anywhere from $12-30. Although other typefaces can cost much more, I like finding these types of fonts that are more affordable and that I know I am legally “OK” using. You can usually still find a collection of free fonts on the premium sites as well. Free or premium, the best brands tend to use a solid and effective pairing of serif and sans serif typefaces. For help with choosing the right fits, check out my post about this very topic. No matter what font selections you make, just remember that if you’re going to use it for your brand (or you’re a designer working on a client’s brand) you must check the licensing. If it’s a free font, is it free for personal + commercial use OR just personal? If it’s only free for personal use and you buy a license (even for just $12) — that’s just (1) license for your use, on your computer. You’ll most likely need to buy a second one for client or vendor use. “How do I pick fonts?” is a really common question that I’ve gotten since I’ve been branding clients, especially the last couple of years. Although your brand can evolve, change and certainly grow with you over the years, typefaces and color palettes are major components by which your audience comes to recognize you. You don’t want to constantly be switching things up every few months. While there are endless options and varieties of fonts floating around all over the world, this is a simple, classic and always solid way to look at and start pairing them together. It’s a rule of thumb that I was always taught in design school. Choose a serif (in “regular, non-design terms” think Times New Roman) and then choose a sans serif to offset it a bit (again, in “regular, non-design terms” think Arial.) You want something that is easy to read, especially in large blocks of copy. And, you want something that can be used to help break up the copy and will give a viewer’s eyes something else to rest on and look at. Also, a big tip is to choose fonts that come from “families” basically meaning that there are different variations of each (like regular, bold, italic, etc.) – this way, they will be more versatile to work with. What is your brand representing? Who are you, what do you do, what are you about and whom do you serve? How do you want to make those people feel? Think about the experience that you want them to have when they come into contact with any aspect of your brand. The typefaces that you use within your logo, website, marketing materials and social media graphics need to tell stories and represent your brand accurately. So, consider if you want that style (and in turn, the fonts) to be light, modern, sophisticated and soft — or big, heavy and bold. Fonts and the right combinations of them can provide you with major impact — and look and feel. It’s usually smart to purchase your font collections, so that you can own desktop and website licenses to use them. Less people might be likely to have them. And many times, they are higher quality and legally safe to use. Creative Market and My Fonts are great resources for purchasing them. Other designers will advise against downloading free fonts, but I don’t totally agree with that. I have downloaded A LOT of free fonts over the years and they’ve functioned perfectly fine and fit the projects that I needed them for. You can use Font Squirrel or DaFont to browse countless options. The downside is that of course, anyone can download them, so they won’t always be as original — although they can still be effective and professional to use. The same can be said for purchased fonts — anyone can purchase the same ones that you do. So, it’s really up to you and whatever your budget is!